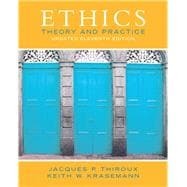 With a clear presentation, Ethics: Theory and Practice educates readers about ethical theory and applies concepts to classic and contemporary moral problems (lying, cheating, establishing ethical business practices, honoring ethical obligations in medicine, etc. ).This title educates readers about ethical theory and its applications in a way that beginning students can understand. Ethics is neither technical nor does it plunge readers into complex readings without sufficient background. This title is fully updated with global issues and non-Western ethical views. Besides updating the foundations of the book, the author incorporates new and relevant material, most of which is often unique only to this title. Jacques P. Thiroux is Professor Emeritus at Bakersfield College and Califorrnia State University. Keith W. Krasemann is Professor of Philosophy and Religious Studies at College of DuPage. What is Philosophy and Ethics’ Relationship to It?